For the next little while, I’m going to be looking at how GBT introduced each of these ideas during the first year or so of Doonesbury’s run and set himself and his characters up to explore them. I’ll do my best to frame each theme around a particular character or set of characters. This week, radical campus politics through the eyes of Mark Slackmeyer. But first, a quick diversion about the general political culture of Doonesbury’s first few years. Trudeau’s “Core Four” of B.D., Mike, Mark and Zonker each represent a distinct faction in Boomer political culture. From right to left: B.D. is a young Goldwater Republican; Mike (leaving aside the strong misogynistic tendencies he displayed in the early years) is a bleeding-heart liberal; and Mark represents the radical left. Fluttering about in no particular lane is Zonker, a head who has believes in neither the bullet nor the ballot. In later posts, then, I’ll come back to B.D.’s hyper-patriotic conservatism, Mike’s wishy-washy liberalism, and Zonker’s flying-of-the-freak-flag. We first meet “Megaphone” Mark Slackmeyer on 19 November 1970, as he calls out Mike’s political spinelessness. Mark represents the New Left phase of the American revolutionary tradition – movements like the Students for a Democratic Society and the Weather Underground. Mark actively opposed the war in Vietnam, read Marx and hoped to see the end of capitalism, and was an active ally in struggles against racism and sexism. Our first extended encounter with Mark follows him as he stages a one-man occupation of Walden College’s president’s house, one he narrates as a historical epic starring himself. Trudeau often had characters act as their own interior sportscaster, calling the play-by-play on whatever they were up to, much as a sandlot baseball player might “call” his or her on-field performance as they strive to emulate one of the game’s greats. 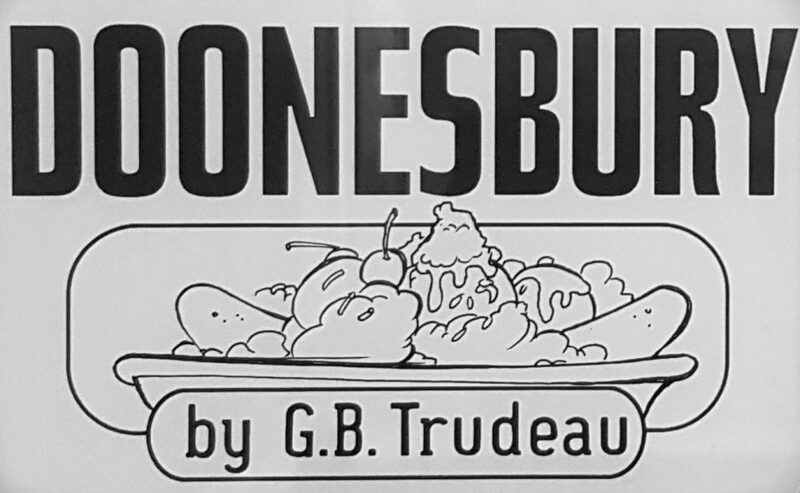 Garry Wills, in his introduction to the first hardcover Doonesbury complication writes that this device allowed Trudeau to comment on how people understood their actions in terms of a larger ongoing narrative: Doonesbury’s characters are “watching each other watch themselves” as they play their ascribed roles. As Mark watches himself play the role of the radical campus activist leader, Trudeau uses his experiences to satirize elements of the radical campus politics of the Vietnam era. Mark’s play-by-play on his solo occupation of Walden College’s president’s house, for instance, points at the egotism that seems all too common among political leaders, while hinting at some the darker elements of the political climate of the times. Another element of radical politics that Trudeau explores through Mark is the gap between student activists – who often come from a comfortable backgrounds which give them the opportunity to immerse themselves in political theory – and the people on whose behalf they claim to be struggling. Mark may be out on the streets fighting capitalism, but he’s the son of a wealthy stockbroker, and his family has servants. This distance between students and workers is the theme of a long July 1971 arc in which Mark takes up a summer job on a construction site. He wants to connect with the working class and introduce them to revolutionary theory; instead, his self-superior attitude leads him to alienate his fellow workers. Instead of forging a student-worker alliance, he spends much of his time getting beaten up. Unable to get through to the workers, Mark talks down to them – and reveals something about how he actually feels about his ostensible allies in the working class. Of course, those working-class revolutionary allies often know their revolutionary theory better than the academic “experts,” as we see in what is one of my all-time favourite Doonesbury strips. The bricklayer represents what the Italian Marxist theorist Antonio Grasmsci called an organic intellectual, a thinker who emerges from within the working class, and is thus better-positioned than a stockbroker’s son to help workers understand their circumstances and envision a road forward. “The greatest mystery is not that we have been flung at random between this profusion of matter and the stars, but that within this prison we can draw from ourselves images powerful enough to deny our nothingness.” — André Malraux. 17 July 1971. As student activists are alienated from important elements of the society they hope to change, they are also often alienated from each other – and inept as a result. A long December 1971 arc featured Mark’s experience as the moderator at a radical campus activist congress reveals how sometimes, it seems as if activist movements can be their own worst enemies. One strip from that sequence brings into focus an American tragedy that Trudeau commented on through Mark’s experience, that of the violence inflicted by the state on those who fought for a better world. The young women and men who struggled in the 1960s and 1970s for equal rights, equal opportunity and equal justice for African-Americans, migrants, women, and LGBT people, and who fought to end a brutal and unjust neo-colonial war in Vietnam, Laos and Cambodia, fought a system that was built on violence and never shrank from using violence to maintain the social order. As we see above, Mark’s first campus occupation ends with the arrival of “baby-blue helmets,” striking visible fear into our previously-confident hero’s heart. A few weeks later, a Trudeau gives us a bit of dark humour on the use of surveillance and chemical weapons against protesters. There were any number of atrocities committed by the American state against the revolutionary movements of the 1960s and 70s; the Murder of Fred Hampton; Attica; Chicago ‘68. But one horror seems to have had special significance to a young Garry Trudeau. On 4 December 1971, a young man proposes the congress issue a statement calling for “an end to government-sanctioned violence.” When B.D. challenges the man on his right to talk about violence, we get one of the darkest punchlines Trudeau ever penned: he’s the delegate from Kent State. The May 4, 1970 murder of four students at Ohio’s Kent State University was the subject of at least three strips in the first fifteen months of Doonesbury’s run. On 28 November, things take a dark turn as Mike announces that he has moved on from being outraged over Kent State: if he were to stay angry about Kent State, he reasons, his “indignation over Attica would be compromised.” A few months later, we find Zonker reflectively issuing a bitter commentary on the anniversary of the massacre at Kent State; using the voice of a character who rarely follows current events to comment on the massacre two years on conveys the scope of the tragedy for Trudeau and his contemporaries. Mark will remain a crucial voice for radical political ideas as the strip moves forward, even as he loses some of his edge with age. He allows us to see the political idealism of his era in terms of its triumphs and its defeats, whether those defeats were self-inflicted or the outcome of state violence. Mark shows us, above all, the human foibles that shape any political undertaking; after all, like all of us, revolutionaries are just regular people who want a better world, and love chocolate chip cookies. I say “seems to” because I’m still reading through the strip and can’t vouch for what I haven’t read yet. Also, there may very well be sexism/misogyny that I don’t see in the post-Nichole strips that I have read. Garry Wills, “Introduction,” in Garry B. Trudeau, Doonesbury Chronicles (New York: Henry Holt & Company, 1975).